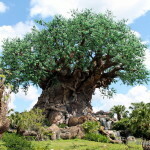 2016 is gearing up to be a positively HUGE year for Disney’s Animal Kingdom. 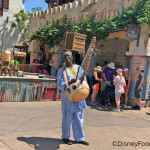 The headlining news revolves around the highly anticipated Rivers of Light spectacular, which — along with evening journeys at Kilimajaro Safaris also beginning sometime in the spring — will transform Animal Kingdom into a park with nighttime activities for the first time. Naturally, this transition into a full day park will affect dining options, since expanded operating hours will result in a larger need for more dining opportunities. 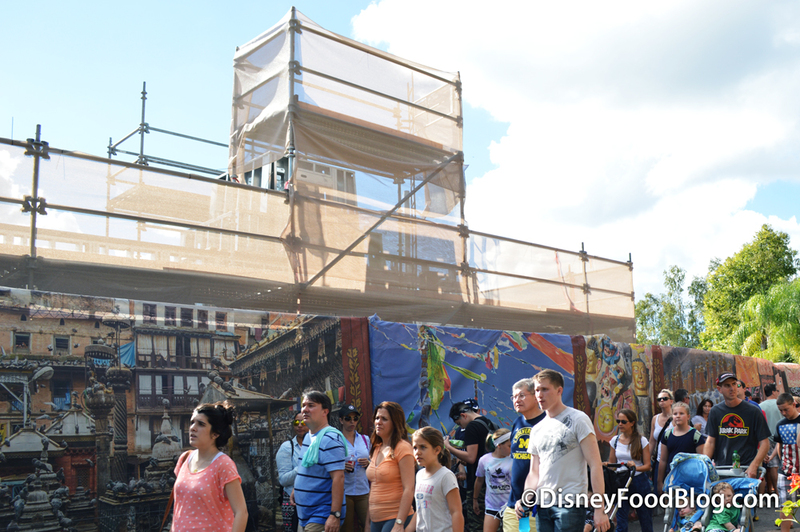 In fact, it’s already been announced that Animal Kingdom will also be getting its first Signature Restaurant in 2016, Tiffins. But it’s not just huge shows and signature eateries coming to Animal Kingdom. Some additions are more subtle, but certainly still worth noting. For instance… SURPRISE!! As of this past Saturday, there is a brand new bar and snack stand you can now enjoy in Animal Kingdom’s Asia. 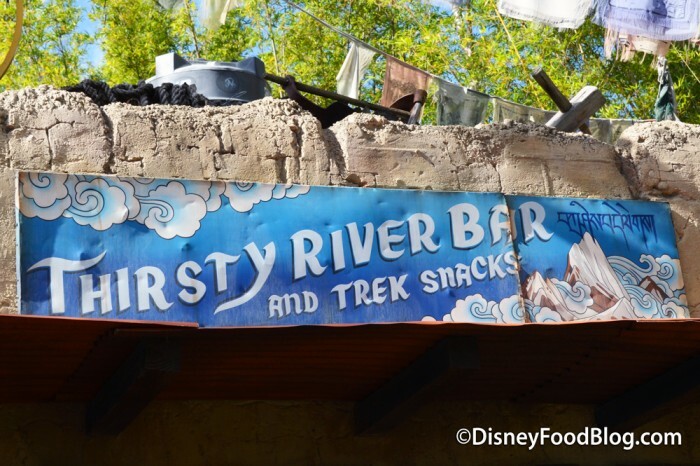 Welcome to Thirsty River Bar and Trek Snacks! Let’s have a look! 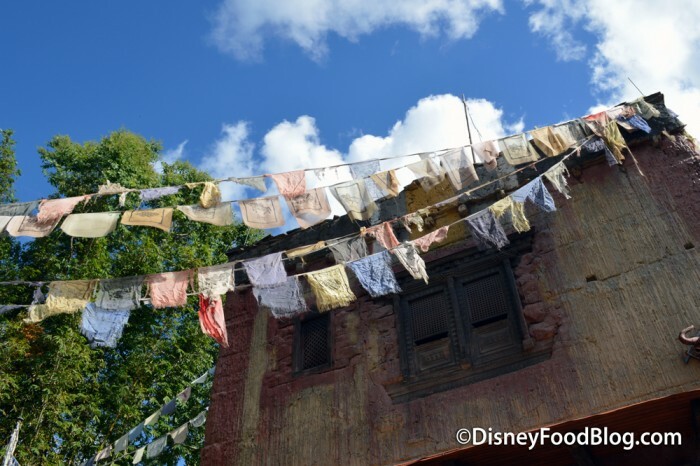 Just within view of Expedition Everest, you’ll find Thirsty River Bar and Trek Snacks waiting to greet guests fresh on their way to (or from!) their encounter with the mountain’s Yeti. 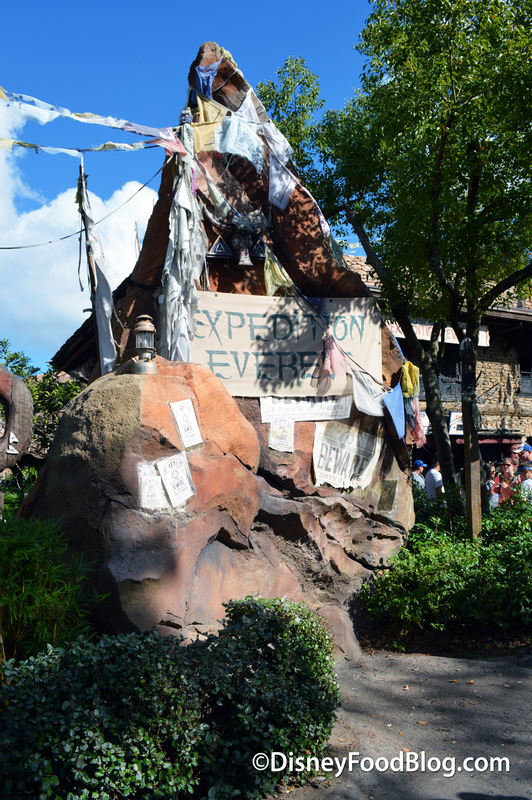 You may be familiar with this spot if you ever grabbed a good old-fashioned paper FastPass for the popular attraction from the FastPass distribution machines… when such things existed all those many years ago, that is 😉 . Looking back, maybe the teeny, random pop-up bar that was often spotted in this same general area was something of a test for a more permanent bar in this setting. Still, though a more regular operation, Thirsty River doesn’t offer the same sit-and-stay-awhile vibe of the Dawa Bar in Animal Kingdom’s Africa. 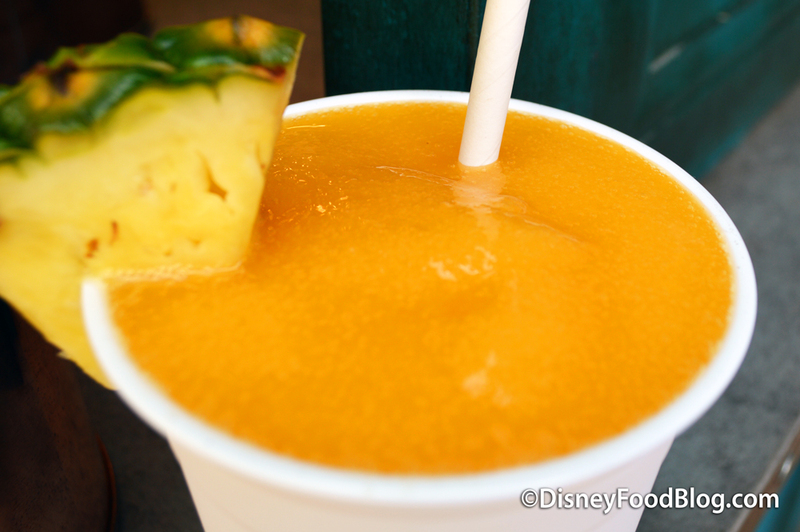 It’s more of a sip-and-stroll experience since there’s no seating to speak of. 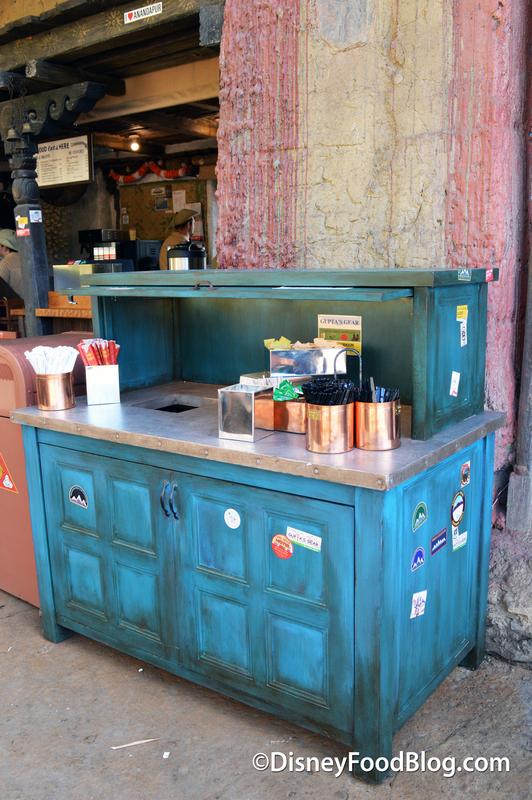 It’s a simple walk-up counter setup with drinks (Thirsty River Bar) on one side, and food (Trek Snacks) on the other. 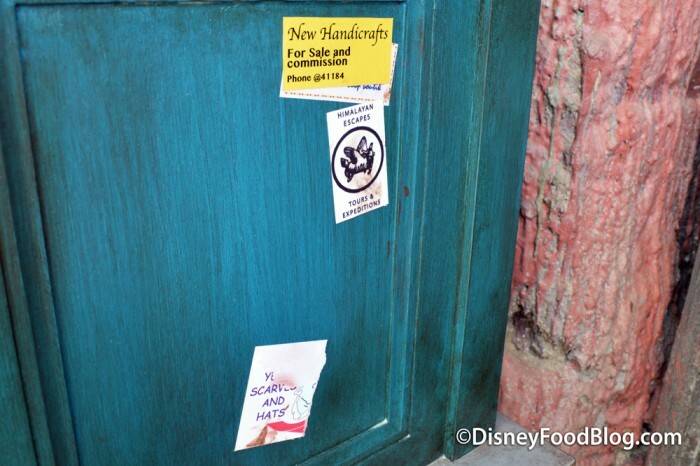 Still, because we’ve learned to expect nothing less from Animal Kingdom, we were keen to spy a few of those beautiful and often intricate details that are the park’s signature. 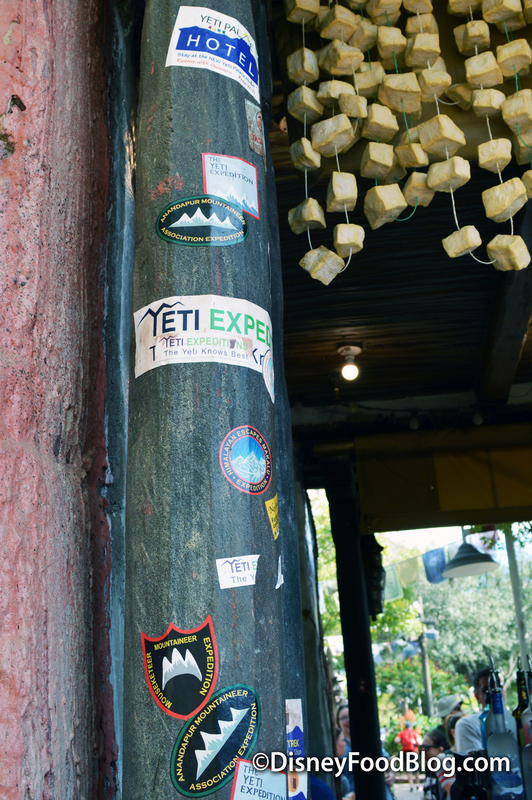 Be sure to take a walk around the entire bar to spot some perfectly-themed and clever stickers! 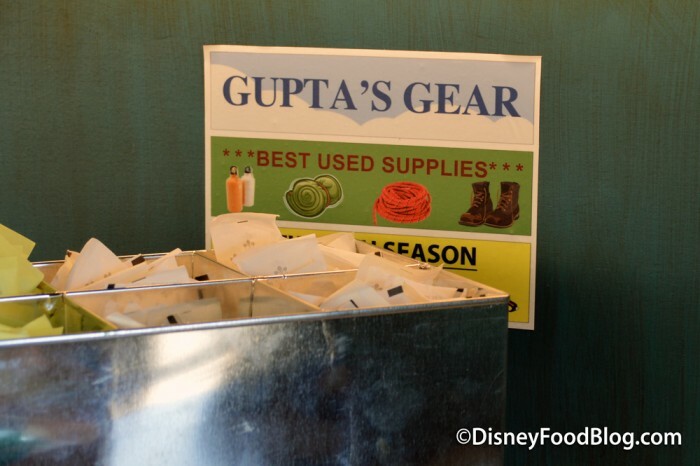 Yep, Gupta’s Gear has made its business presence known at the Thirsty River Bar, too 🙂 . The Tibetan prayer flags that can be spotted all over the Asia section of the park can be found here as well. 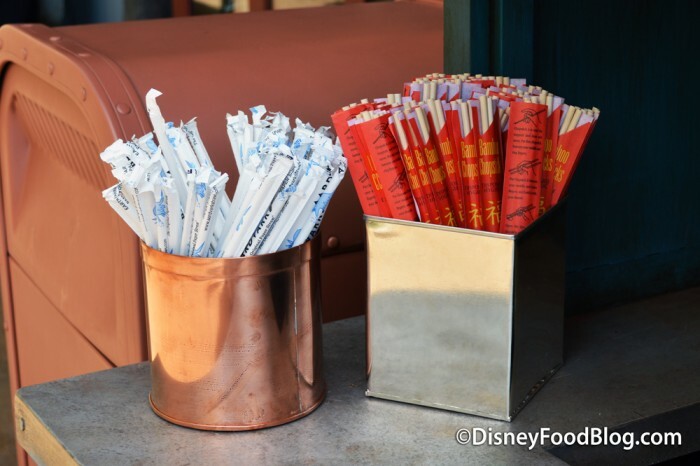 Small, wonderfully weathered-looking condiment stations can be found at each side of the new spot, complete with those trademark Animal Kingdom paper straws and chopsticks. So, I think it’s time to see what you’ll be sippin’! 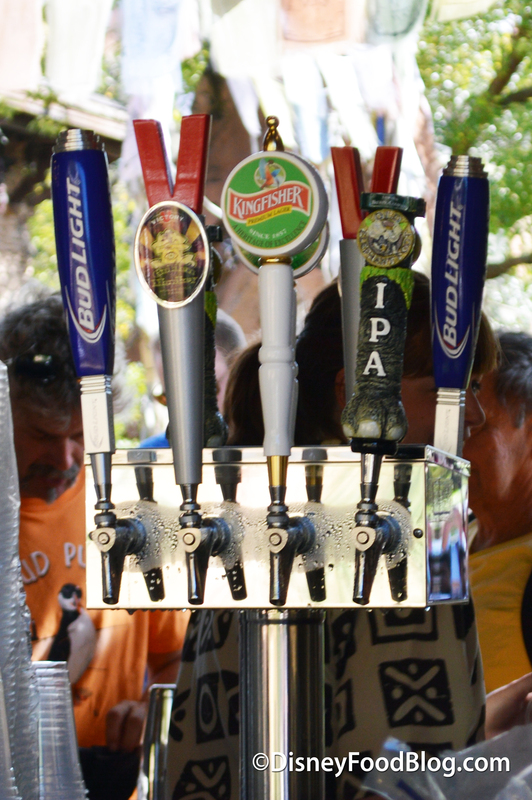 Are you hungry or thirsty… or both? 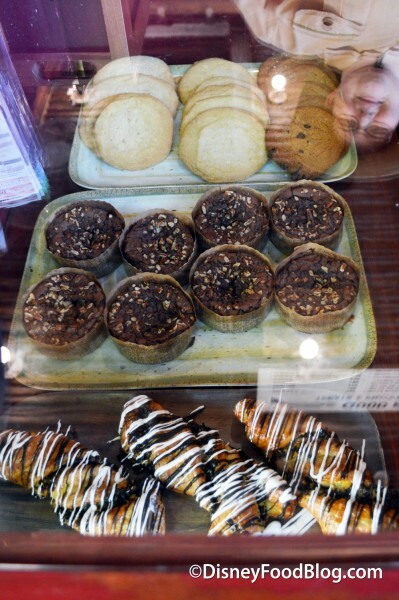 No worries — as we mentioned, there are two sides to Thirsty River Bar and Trek Snacks to take care of you 🙂 . Starting with the bar portion, drinks include frozen and mixed cocktails and mocktails, along with a selection of beer (on tap and by the bottle or can), and wine. 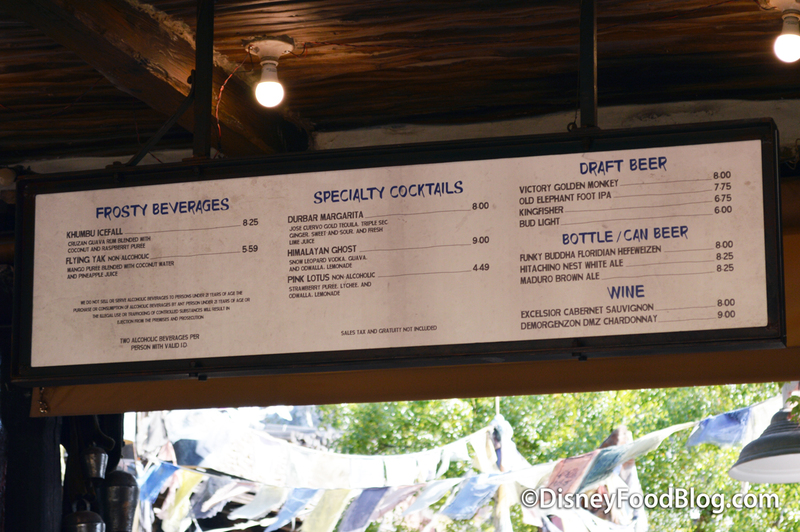 The Khumbu Icefall and Flying Yak (we’ll be trying both in just a moment) make up the Frosty Beverages, while Specialty Cocktails include the Durbar Margarita (traditional, but with ginger providing the twist), the Himalayan Ghost, and the non-alcoholic Pink Lotus. 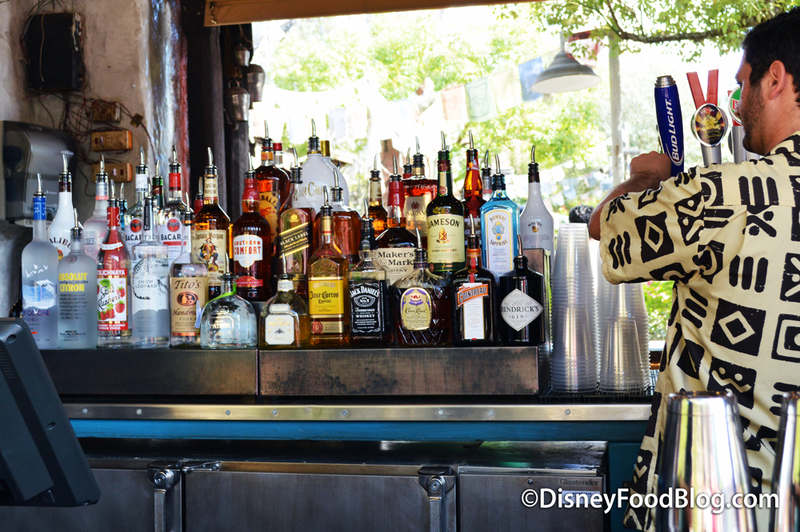 Thirsty River offers a full bar as well, and both sides of the bar were staffed with obviously experienced bartenders ready to serve up a wide range of cocktails. Starting with the Frosty (frozen) Beverage options, let’s go with the grown up one first ;): the Khumbu Icefall! 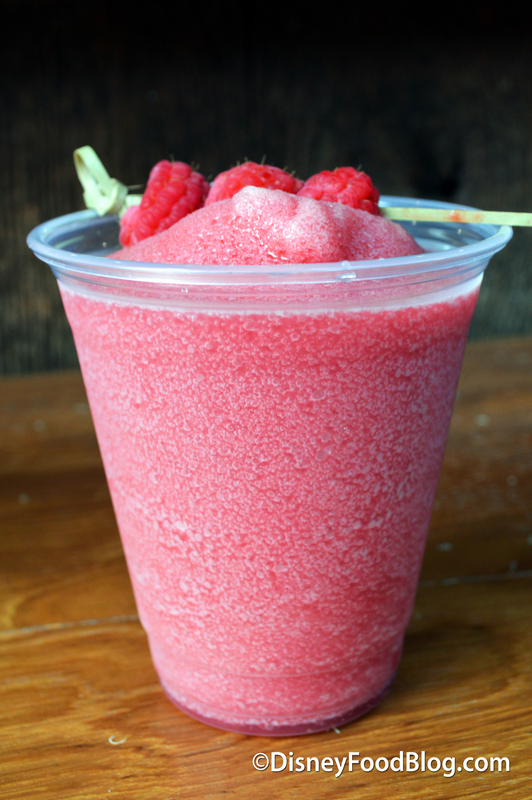 This DELICIOUS drink is made with Cruzan Guava Rum, coconut and raspberry puree, all garnished with three raspberries. It’s a fun, refreshing combination of fruity flavors alongside the coconut. Even amidst all that flavor, I was happy to be able to taste the rum as well. 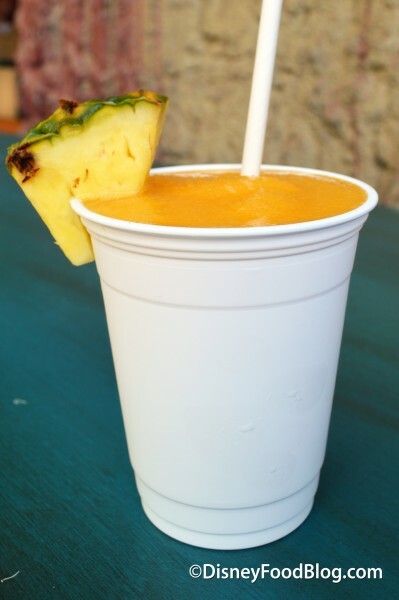 Up next is the kid-friendly (non-alcoholic) Flying Yak, a blended combination of mango puree, coconut water and pineapple juice, dressed up with a small wedge of pineapple. I really liked the flavor combo with this one, too, but it’s definitely on the sweet side, so it will likely be a favorite for the kiddos! The Himalayan Ghost cocktail is one of the Specialty Cocktails available. It’s made with Snow Leopard Vodka, guava and Odwalla lemonade. 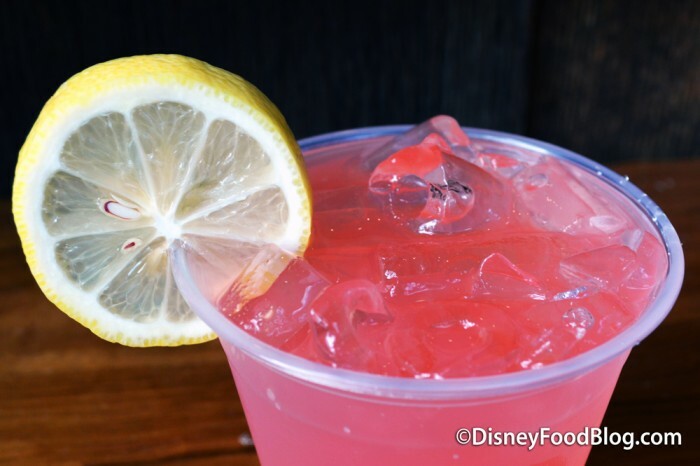 Looking pretty much like a strawberry lemonade, I was surprised to find that the guava really does give it a different flavor, coming together with the other ingredients to resemble pear, more than anything. 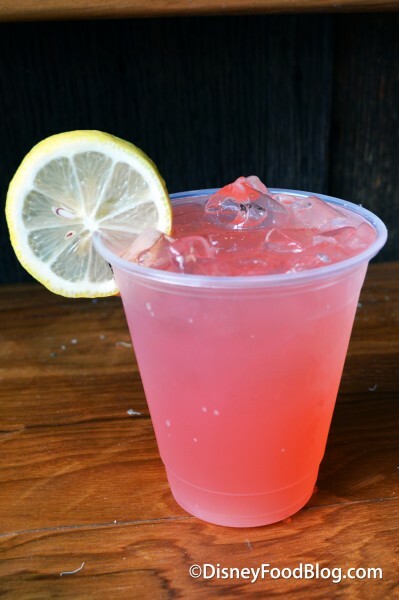 The Pink Lotus, by the way, is a non-alcoholic option that is similar to the Himalayan Ghost, but with strawberry puree, lychee and Odwalla lemonade. Draft beer selections include Old Elephant Foot IPA and Victory Golden Monkey (which you may be familiar with if you frequent the Dawa Bar). 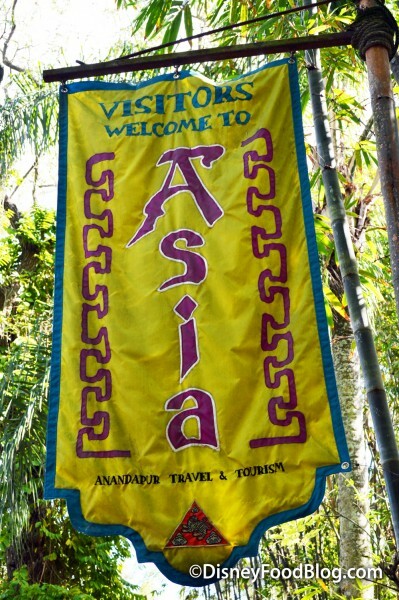 But visiting Asia, I wanted to try an Asian beer! 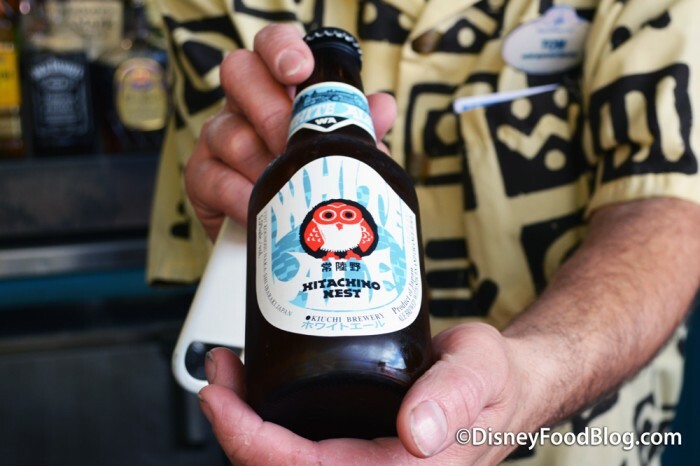 The bartender recommended the Hitachino Nest White Ale, one of the bottled selections. 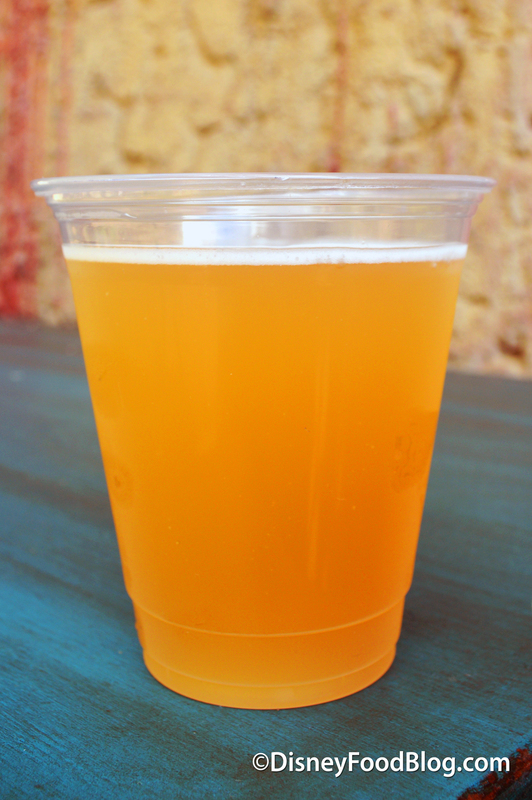 It comes from Kiuchi Brewery in Japan, and this pale ale is a nicely refreshing choice. I thought it had a good medium flavor for a pale, and I detected some hints of citrus as well. Now onto the next counter to try some Trek Snacks! The food selection here is an interesting assortment. 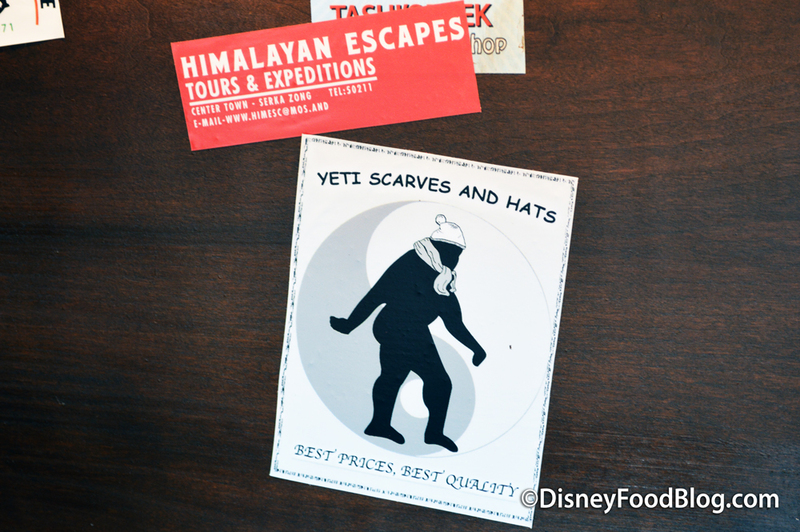 As is fitting for a place without seating, lots of familiar grab-and-go options can be spotted on the hanging menu. It features plenty of well-known ice cream novelties like Mickey Premium Ice Cream Bars and Ice Cream Sandwiches, Frozen Bananas, and Frozen Lemonade or Orangeade Cups, along with a variety of better-for-you snacks that will remind you of the Harambe Fruit Market such as pre-packaged fruit cups, whole fruit, and hummus packages. 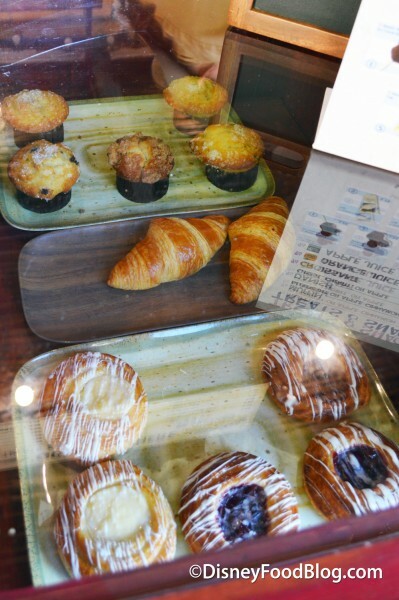 Taking some cues from the Kusafiri Coffee Shop and Bakery, they also offer some familiar Animal Kingdom pastries like Chocolate Twists and Turtle Brownies. 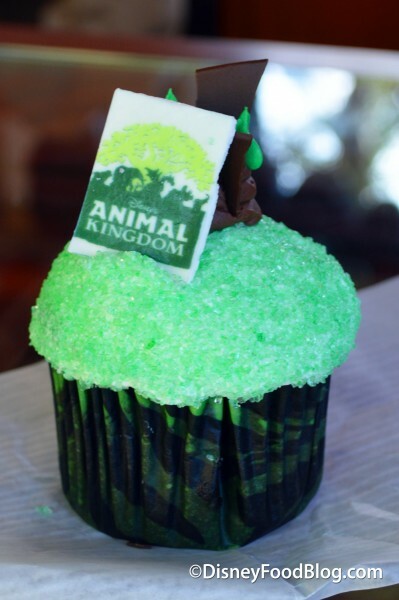 And the Tree of Life Cupcake hasn’t been left behind! It’s all good, but nothing we haven’t seen all around the park before. 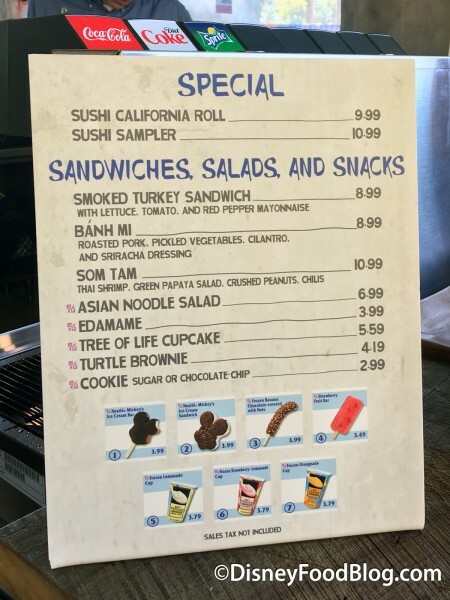 However, if you take some time to find the standalone sign featuring Specials, Sandwiches, Salads and Snacks, this is where things get a little more interesting. 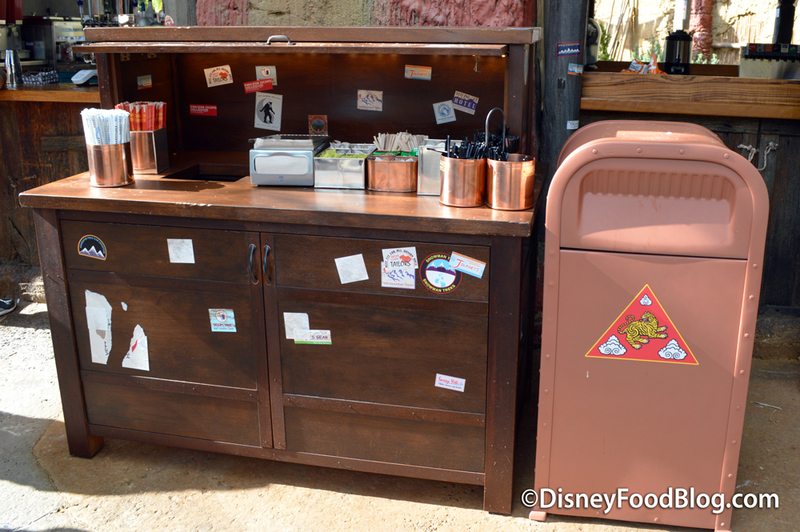 Many guests may now be excited to find Sushi as a grab-and-go option at Animal Kingdom! Choices are a California Roll or Sampler. There are also similar offerings to the seasonally-open Bradley Falls Kiosk, with Asian Noodle Salad and Edamame. 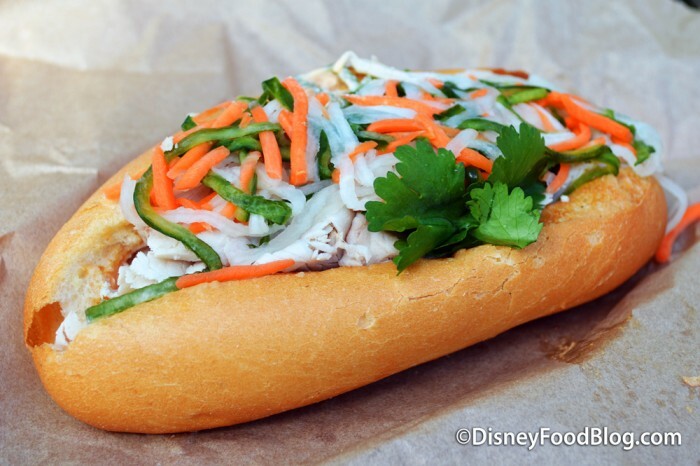 But there are also a few items unique to Trek Snacks, so I thought I’d give the Banh Mi a try! This sandwich is made with roasted pork, pickled vegetables, cilantro and Sriracha dressing, and comes wrapped in paper so it’s easy to carry on a journey through the park. The fresh, crisp pickled vegetables reminded me of an Asian coleslaw, and I enjoyed the subtle spice of the Sriracha dressing. 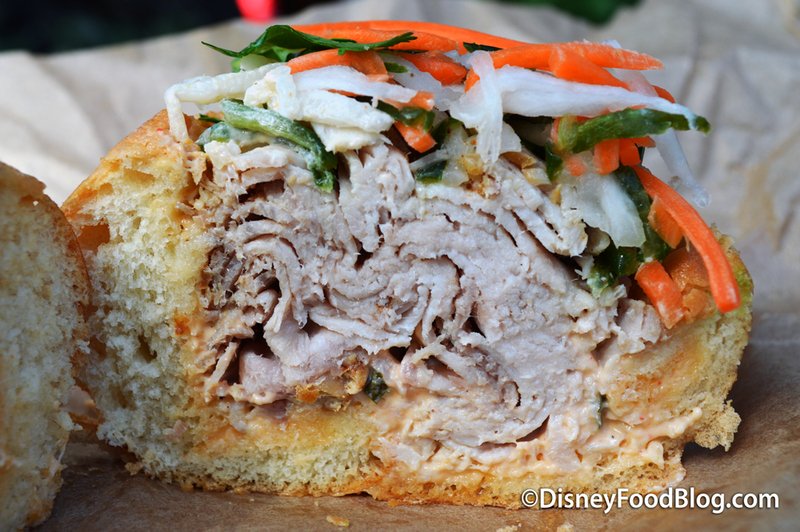 But what I found most impressive was the sheer amount of thinly-sliced pork tucked inside the roll. It’s quite a substantial sandwich, and tasted decently overall. 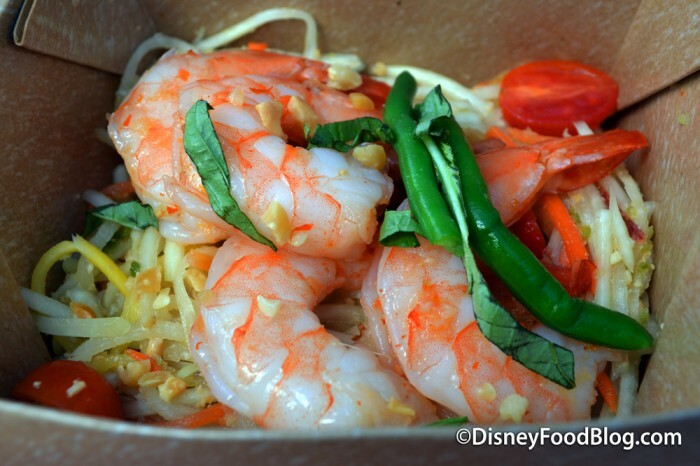 Also new is the Som Tam: Thai shrimp on a bed of green papaya salad with crushed peanuts and chilis. The portion size and brown paper box packaging brought to mind the Trek Power Salad at the Smiling Crocodile (that’s the new name, by the way, for what was previously known as the Gardens Kiosk). I gotta say, Animal Kingdom has definitely stepped it up with some intriguing salad options over the past year. 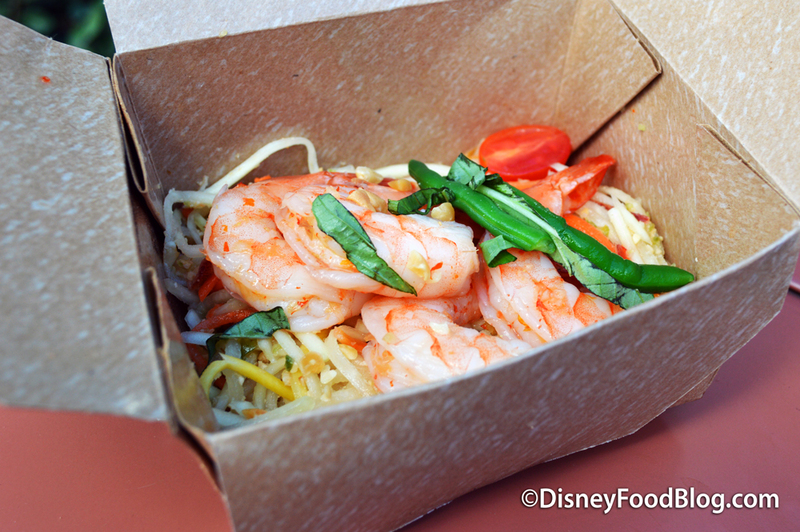 As for the Som Tam, the shrimp were HUGE and tasty! The chilis added a nice heat without being too spicy. 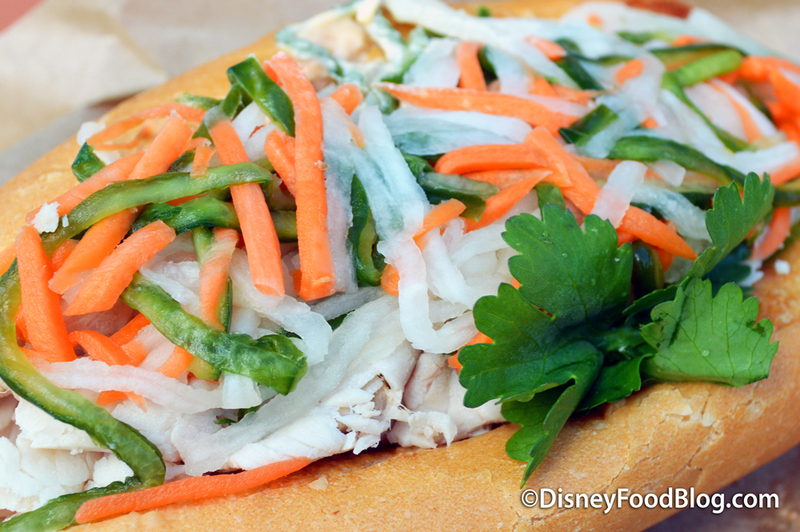 I’ll say this for the Som Tam, but honestly, it goes for everything I tried… I was really pleased by how fresh everything tasted, especially coming from a quick-service spot that doesn’t have a high profile just yet. So, that wraps up our very first visit to Thirsty River Bar and Trek Snacks! 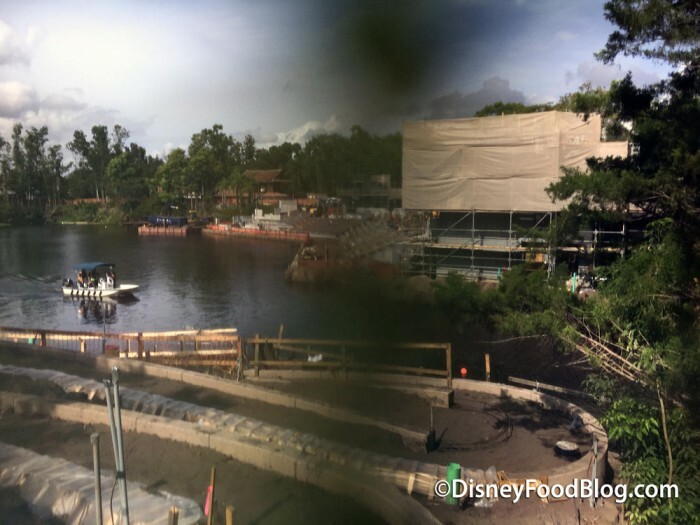 But, hey, while we’re in Animal Kingdom and all 😉 … why don’t we take a small peek at the construction area for the Rivers of Light spectacular? Yep, like I said… 2016 is shaping up to bring BIG things to Disney’s Animal Kingdom! 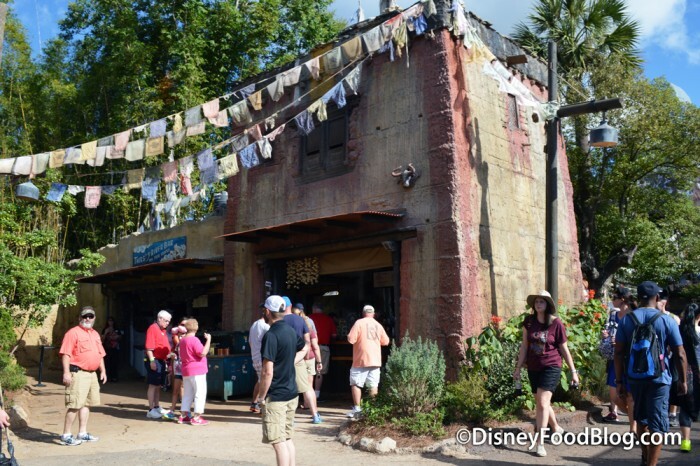 Thirsty River Bar and Trek Snacks is obviously not the only change in store for Animal Kingdom, but I think it’s starting off the new additions pretty well! 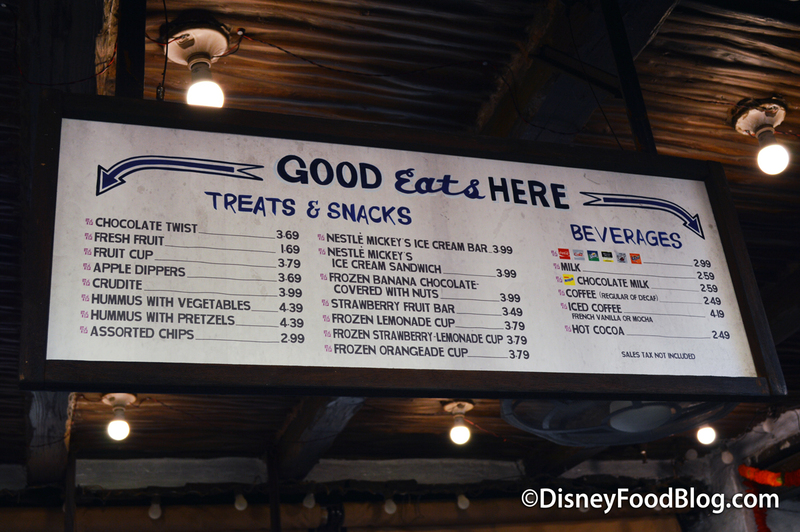 For a relatively small spot, the variety of both drinks and food choices is somewhat impressive. It’s got a little bit of everything, from ice cream and treats for the little ones to some options for heartier appetites, along with some fun cocktails and a decent beer selection. One thing’s for sure: Thirsty River Bar and Trek Snacks makes us even more anxious to see the continued additions to Animal Kingdom! 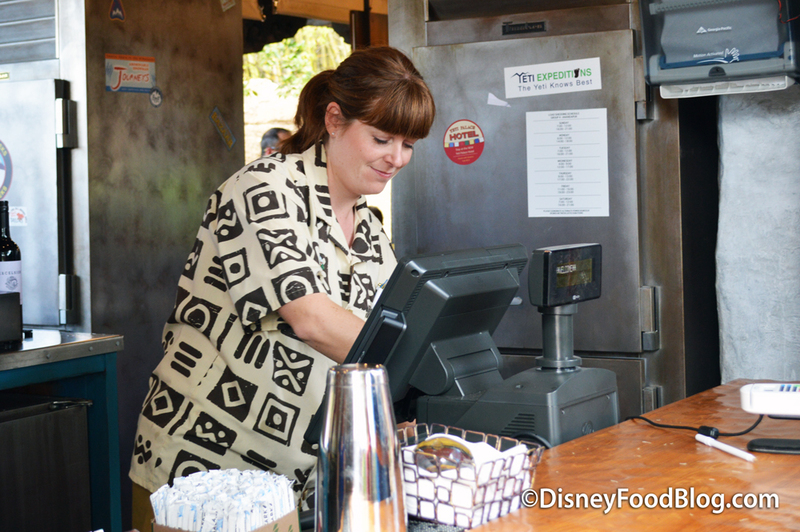 Will you be visiting the brand new Thirsty Bar and Trek Snacks? Let us know in the comments below! First Look! 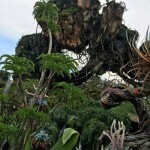 Pandora — The World of AVATAR in Disney’s Animal Kingdom! 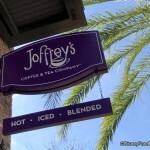 News: Joffrey’s Disney Coffee to be Sold in Grocery Stores Nationwide! « DFB 12 Days of Christmas: Day 8 — Get Every DFB Guidebook for 50% Off Cover Prices! Has the Mickey Ice Cream Bar always been promoted as “Nestle”? Odd seeing that on the menu banner, unless I’ve just never paid attention. Love the new places opening up. Historically using Hopper we do half day in AK, get there early to do Safari when cool so animals more active, get things done quick before crowds pick up and then head out by lunch. Now, with Avatar coming and River of Lights nighttime show, it justifies spending a whole day. 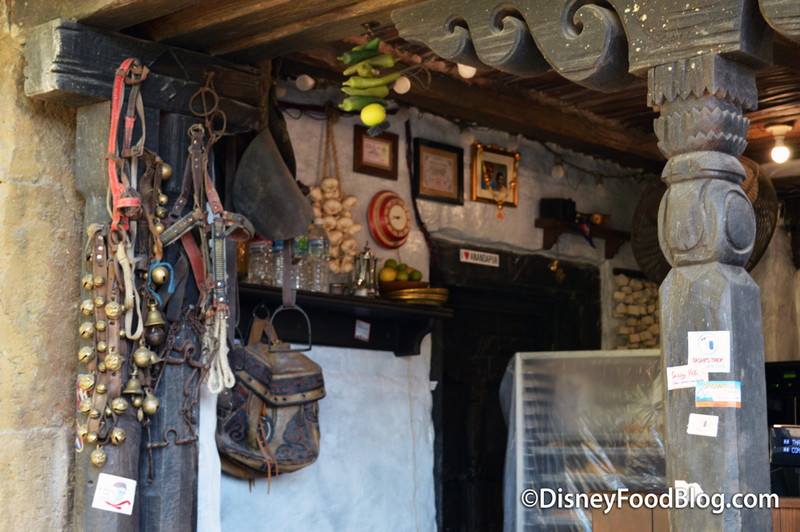 And then you can search into the nooks and find these neat little places to eat or get drinks and slow the day down. 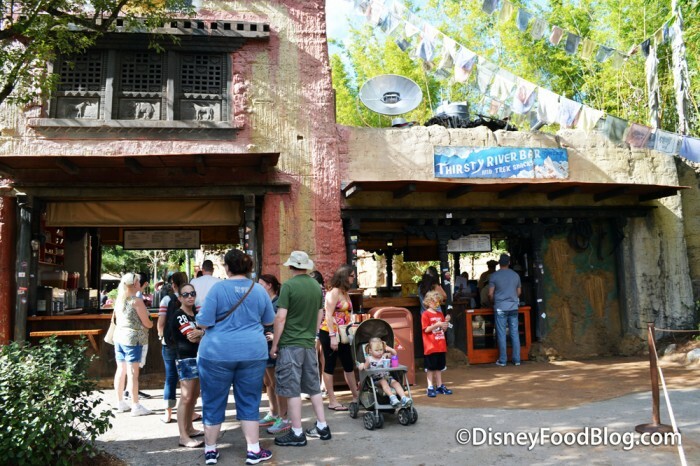 Enjoy Rafiki’s more in depth, enjoy the flora, and definitely enjoy more of the neat ethnic type foods the park has to offer. And the rest of the parks will become less congested at night due to more people staying here for a full day instead of heading out when park closes early and entering the others. This is what fuels us Disney fans, the changes and additions that keep us anticipating the next trip. I saw this place with the construction walls last week so I’m glad it’s open now! 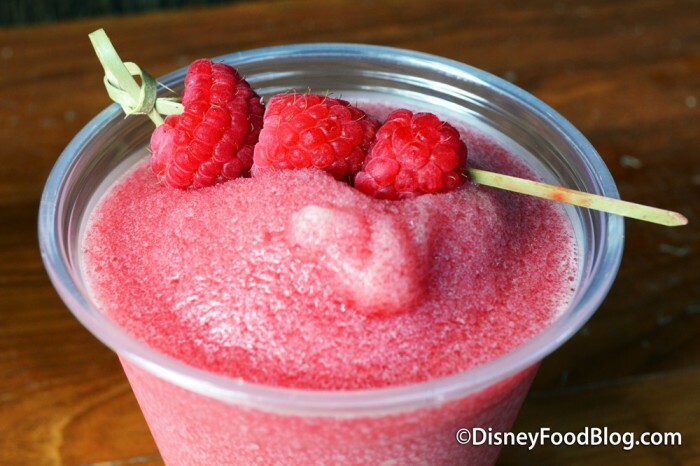 That raspberry drink looks amazing. So does the food you got. 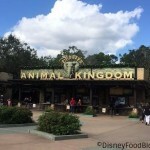 I think Animal Kingdom has really been stepping it up in the food department lately – I loved Harambe Market, I would like to try the mac and cheese stand, and now this! Would huge shrimp be an oxymoron? Thanks for the review! I can’t wait to check this place out the next time I’m there, and hopefully try some sushi or one of the sandwiches! 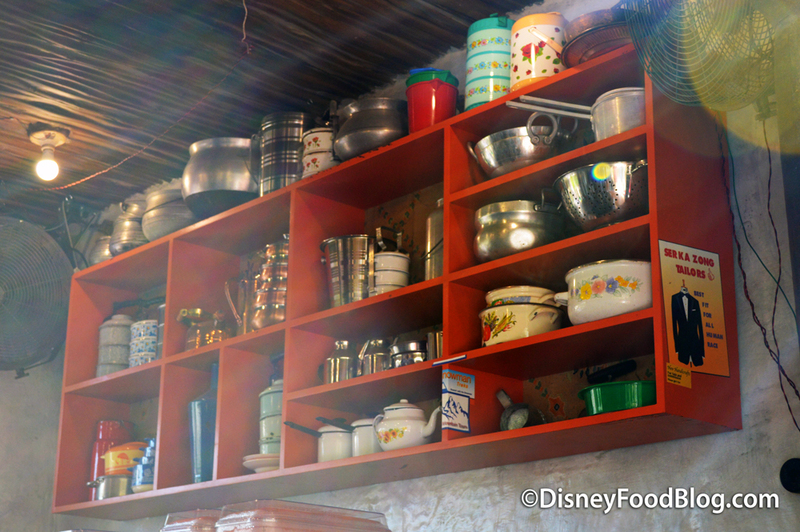 I love the fantastic variety of eats at AK.